When we are young, we are focused on the future. We pay little attention to the stories our grandparents and other older relatives tell. As we get older, an interest in our “roots” becomes much stronger, but by then our relatives may be gone and the stories are lost. 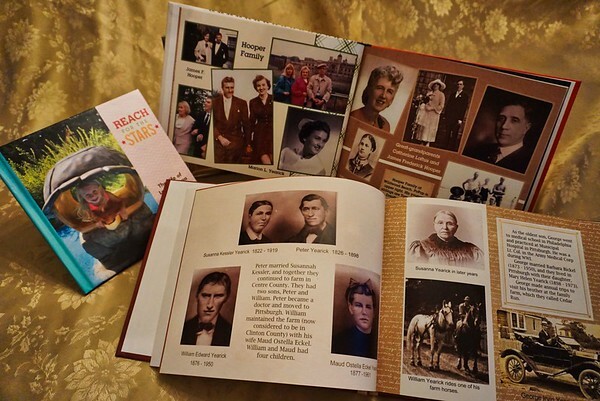 Now is the time to gather those photos and stories and preserve them in a book. Your children, grandchildren and future generations will have a treasured heirloom. Take your life history story further. We can provide genealogy research to explore your family roots. We are not trained genealogists, but have extensive experience using Ancestry.com and other family history tools. You don’t have to be a celebrity to write a memoir. It is natural to want to know that our lives had meaning and that somehow we made a difference. Through a memoir we can document what was important to us and share what we have learned about life. By sharing your story, you may inspire and motivate others. Even if you don’t share the book now, the process of creating your memoir may help you relive pleasant memories and bring closure to challenging times. One of the worst aspects of Alzheimer’s disease, or other traumatic brain damage, is memory loss. Upon diagnosis, it may help to create a life history or memoir book, before those memories fade. Once the disease worsens, looking through photos and stories in a memory book may temporarily restore those memories. Caretakers can also create and share these books with their loved ones. Have you ever wished you had your grandma’s chocolate cake recipe, or your uncle’s rib sauce? Organize your family or group to share those recipes in a personalized, “tried and true” cook book. We can provide a link so that members can upload their recipes, and then we will organize and produce a “family cookbook”. This could be the highlight of a family reunion. How much will a book cost? Prices will vary depending on the scope of the project and the type of printing and cover that you choose. We provide a free 30-minute phone consultation to discuss the project. This will be followed with a contract, outlining the services you require and the projected delivery date. · In-depth phone interviews: $25/hour. · Personal visits to conduct interviews: $60 for two-hour visit plus travel costs. · Enhanced book cover (ex. leather or silk) and printing. · You will receive one round of review, for edits. Additional rounds of edits will cost $20 each. · Scan Pictures: $.25 each (quantity discounts available). · Rush Order: available at additional cost. · Books generally take 4 – 12 weeks to create, depending on complexity. · A 50% deposit is required at the time of the order. Full payment must be made within one day of final approval. · Payment can be made by Paypal, personal check or money order. Note: if paying by personal check the order will be shipped after the payment has cleared the bank (usually 5-7 business days).